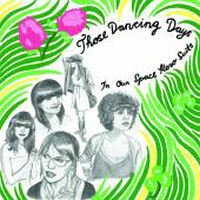 By most standards, In Our Space Hero Suits, the debut album from Those Dancing Days, should be a highly annoying listening experience. For starters, the group hail from Stockholm, and thus automatically become possible heirs to the ABBA/Roxette/Ace of Base tradition. Add to that their just-out-of-high-school pedigree, status as European buzz-band of the moment, and employment of a Hammond as the lead instrument on their jangly brand of uptempo pop songs about boys. In other words, they should be dead to the discerning music aficionado but a feast for the teeny-bopper’s ears. Yet no sooner do the six seconds of “Knights in Mountain Fox Jackets” herald the onslaught of relentlessly giddy throwback tunes than it becomes clear: the five young ladies who make up the group not only understand your apprehensions, they’re going to do everything they can to help you get over them. Kicking off with the overtly giddy “Falling in Fall” and never really letting up for any of its 39 minutes, Hero shows a young band remarkably aware of how to capitalize on its strengths but also very rarely willing to stray from them. At times this gives a certain sameness to the songs, and some of the middle tracks certainly suffer as a result, but when the band is firing on all cylinders it’s hard to deny their pop sensibilities. The ascending chorus progression and rolling toms of second track “Falling in Fall” are as well-placed as anything Blondie ever did, but the reusing of the same formula wears thin by the time of “Actionman,” the sixth track. When the band tries to make an epic (five minutes certainly feels epic when everything else clocks in at three) of it on album closer “Space Hero Suits,” the results can be described as admirable at best, disastrous at worst. But like anything by any well-studied, well-crafted pop outfit, the high points of Hero are as good as music gets; the falsetto vocal tricks on “Home Sweet Home,” handclaps of “I Know Where You Live” and pulsating synth leads of “Those Dancing Days” could stand toe-to-toe with anything more “serious” acts ever put their stamp on. In Our Space Hero Suits is far from perfect, but its short running time makes it a little easier to handle and its numerous standout moments suggest not only that we haven’t heard the last of the group, but that we might even have reason to look forward to what comes next.